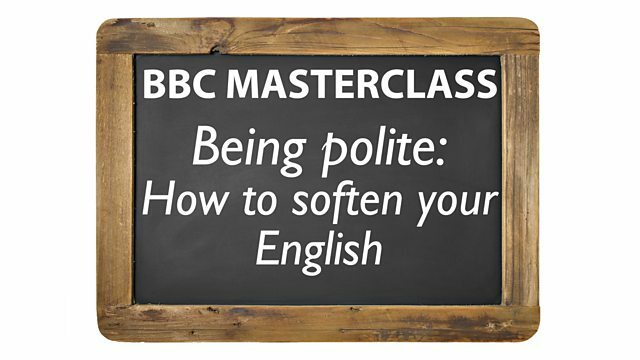 In this Masterclass, Sian's going to show you how to soften your English and be more polite. Sian's going to show you 4 ways not to offend people by being too direct. Hi Sian here for BBC Learning English… in this Masterclass we're going to look at something British people love doing! Being polite. 1: Requests, suggestions and questions. OK, listen to these two requests. Which one sounds more polite and less direct, and why? OK, listen to these two opinions. Which do you think sounds less direct and more polite? Number 1: You're too young to get married! Or number 2: I reckon you're a little young to be getting married! Ok now listen to these two problems. Which one sounds less direct? Yes, the second one was softer, less direct. We introduce problems with verbs like seem and appear to soften them. So, ‘You appear to have saved over all my documents’. You can also use these to introduce your own problems. So, ‘I seem to have lost those reports you wanted’. Now listen to these two ways of refusing an invitation. Which one sounds less direct? Now to find out more about avoiding being too direct, and to practise not being rude, I was hoping you would check out our website bbclearningenglish.com. See you soon, goodbye! A quiz based on the video "Being polite: How to soften your English." How can we make these sentences more polite? Choose the correct option. How can we be polite with requests, suggestions and questions? I want steak for dinner. How do we make giving opinions more polite? How do we discuss problems politely? You wrote the report wrong. How do we say no politely? I'm not coming to your wedding. How do we make requests, suggestions and questions more polite? I want to borrow £5. That wraps up this week’s Masterclass. We were hoping that it was useful to you. Do join us again next time, won't you? Use past forms, continuous forms or both to soften. Use a negative question with a question tag. Use verbs like reckon, guess, feel to make your opinions less direct. You can also use vague expressions like ‘sort of’, ‘kind of’, ‘a little bit’. You can also make it into a question. 'I reckon you're a little young to be getting married! Introduce problems, including your own, with verbs like seem and appear to soften them. Use tentative language to say no politely.